Bob Baffert must laugh at his luck at times. He has two of the likely favorites for this race already set, and as I write this Improbable hasn't run his last prep yet and could be another Derby favorite with a bit of luck as well. This horse is the reigning Two-Year-Old Champion, his breeding is spectacular, and he can run any kind of race. You would think after two Triple Crowns in four years that Baffert would want to give someone else a chance, but that sure doesn't seem to be the case. Is this his next Triple Crown race winner? Or his next Triple Crown winner? Last race: Game Winner was fourth early on in the Santa Anita Derby, and he stayed there through the first half mile. He moved up gradually and took the lead with a sixteenth of a mile remaining, but he couldn't hold off stablemate Roadster. It was a solid race on a heavy and slow track, and he made things harder for himself than he needed to by going wide on both turns and running considerably further than the winner. But it is unfortunate that he got caught - ideally that wouldn't happen in a final prep race. Prior experience: The colt made his debut in a maiden race in August at Del Mar, winning at six furlongs. He came back just two weeks later, winning the Del Mar Futurity at seven furlongs, beating Roadster this time. Then he handily won the first running of the renamed American Pharoah Stakes at Santa Anita. 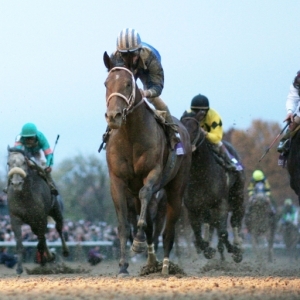 That set him up for the Breeders' Cup Juvenile, where he remained undefeated and secured Two-Year-Old Champion honors. That race was at Churchill Downs, so he likes the track he will face in the Derby. After a break, he was supposed to come back in the San Felipe, but that race was cancelled when Santa Anita was closed for emergency renovations and Baffert was left scrambling. He was sent to Oaklawn for the Rebel, where he dueled with Omaha Beach before losing by a nose. It was a nice battle, and it was the first race off a long layoff, so the result was fine - though, again, it would have been nice to see him win it. Trainer: Bob Baffert won the first Triple Crown in 37 years in 2015 with American Pharoah. Then he won another three years later with Justify. He has won the Derby three more times, the Preakness five more times, and the Belmont once. And I could go on and on. He's the best there is - perhaps the best there ever has been at dealing with three-year-olds. And his stable is loaded again this year - it's not often that the two-year-old champion isn't even your best horse. Jockey: Joel Rosario is a consistently strong jockey who has finished in the Top 5 nationally in earnings eight times in his career, and he's in range to do so again this year. He won his first Triple Crown race aboard Orb in the 2013 Derby - a month after winning his first Dubai World Cup aboard Animal Kingdom. A year later Rosario won the Belmont with Tonalist. He has not won a Triple Crown race since, though three second-place finishes and three thirds in Triple Crown races since 2011. None have come since 2015, when he was second in both the Preakness and Belmont. He has nine Breeders' Cup wins, including three last year. Breeding: This is a blue-blood horse - as you would expect given the career he has had already. He is a son of Candy Ride, the Argentinian horse who posted the best Beyer rating in the U.S. in 2003 and is best known as the sire of champion Shared Belief, and 2017 Horse of the Year Gun Runner. Candy Ride's damsire is Candy Stripes, who sired champion Leroidesanimaux and 2006 Horse of the Year Invasor. Game Winner's dam is Indyan Giving, and unraced daughter of champion mare Fleet Indian. Indyan Giving's sire is the great A.P. Indy, who has several Triple Crown race winners among his progeny. A.P. Indy is a son of Triple Crown winner Seattle Slew, and his damsire is Triple Crown winner Secretariat. This is one heck of a pedigree. Odds: Game Winner went off at 7/1 in the final Kentucky Derby futures pool, making him the second choice behind only stablemate Roadster. BetOnline has him as the +600 favorite. Can Game Winner Win the 2019 Kentucky Derby? : Sure. The breeding is stellar, he is versatile in his running style, so he doesn't need a specific race scenario in Kentucky, and his trainer is the master of this race. But this colt has come up short in his last two, and the horses he beat in the fall largely haven't gone on to flatter him. He's absolutely a contender, and he'll be a part of my exotics - an aggressive part - but I'm not convinced he's even the best horse in his barn.